Welcome to the Rekyung Chem website. Rekyung Chem is a young and dynamic company founded in 2008 that enjoys challenges and innovation, and has since contributed to the development of the living chemical industry through such chemicals as base compounds, organic solvents, and cosmetic materials. And through creative, outside-of-the-box R&D and deep passion, we strive for a technology-centric future and a person-centric world, to grow together with our customers. We work towards living chemical solutions to benefit the center of our world, the people, and the environment, and do our best to provide customer satisfaction as our top priority every day. 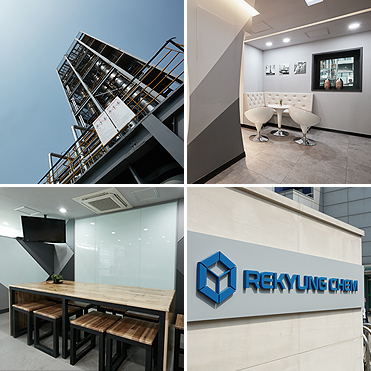 All of us at Rekyung Chem not only work our hardest for our customers’ success, but strive to go beyond our current success through innovation and continuously challenging ourselves. We hope for your unwavering support and interest. the center of the world, and the environment. The materialization of a new Rekyung is shown through its symbol mark the Cube of the Future, which symbolizes the 4 factors of the world, future, people, and technology. It embodies the company’s spirit of continuous change and development.